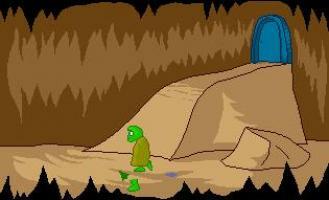 You play Ejak, an alien traveller who has crash landed and got himself stuck in a cave on Earth. Use your time travelling abilities to help him escape! The game is available to download as a ZIP or RAR and both include the MIDI music that features within the game. An entertaining and original little game. Once you wrap your head around the time traveling mechanism, the puzzles are logical. I've just got to wonder why it makes a difference if the old man moves a few steps to the left. Stop searching. You have found the best AGS game. Great game, and animations are even greater! Great use of time travel puzzle. The graphics aren't the best but this was a very enjoyable short game with some clever puzzles based around time travel. Simple yet effective game. And some really original ideas. Also some funny jokes. Cute idea, nice execution, lot of laughs. Very enjoyable! Hey! That alien is in a RON game, "A Better Mousetrap"!!!! Nice small game, wish it was longer. Wouldn't mind seeing a mini-series of this game. Cute game, nice concept, wish it were longer. Well, I played through what I think was most of it (score was 8/15) and I really liked what I saw. The concept was nice, and the GUI interface was done extreemly well. I found a few minor graphical bugs, but that's it. I liked it pretty well, and wish I could've finished it. Nice, it was a bit hard for me to figure it out at first....Then it got going pretty easy. I can say that it was a fun little 15 minutes game. Nice use of Insta-game and I loved the newer animations, good stuff. Seemed like a part of a bigger game, if you are considering doing more, I would play it. This game was great fun! I really liked the jokes and all. Too bad it was so short. A short, pleasant game with an interesting finish. The character in this game uses time travel to get around in this adventure, which as far as I know is an original idea and fairly amusing too.